This trip report of the Nevada Test Site Tour on 2/23/2000 was written for the Dreamland Resort by my friend Connie. She, her husband David and I did the tour together, and Connie did an outstanding job summarizing it in this report. Thank you so much, Connie! All pictures are U.S. Department of Energy photographs. Click on the photos for a larger high-resolution version. As a child in the sixties I never knew or remembered there was a "cold war" and that our country was testing nuclear devices in the Nevada desert. The "duck and cover" drills in the classroom those days were designed to prepare us in case a bomb dropped. Little did I know that during those years soldiers and civilians were being exposed to the deadly radiation from the nuclear tests. I recently had the opportunity to explore the past at the Nevada Test Site and see for myself the remains of some of the 900 tests conducted there. The weather in southern Nevada was ominous that day. Unseasonable rain-gloomy seemed appropriate for the tour. And the landscape presents a stark image - brown, sagebrush, dry lake beds and mountains dotted with pinion trees in the distance. The road leading to Mercury off highway 95 runs about two miles before ending at the D.O.E. Badge office. An image of the workers entering this facility during the test era entered my mind. What must have it been like to work there? I pictured a caravan of workers each day entering the site, leaving families back home for a "day at the office." I was reminded of the men who built Hoover Dam in the 1930's. Like those folks, workers at the test site put in their blood, sweat and tears for the good of the country. I learned after watching old films and newsreels that there was so much fanfare about these tests. The tests were (and still) called "events." 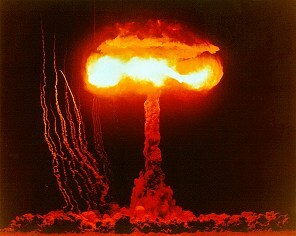 Folks were led to believe that all they had to do was duck and cover should an atomic bomb strike. NTS is simply big. More than 700 miles of paved and unpaved roads run through its boundaries. About 1,100 buildings are on the site, some of which are in the process of being taken down. Upon entering the badge office we were met by a "cammo dude." We presented him with the requested photo identification and were given a numbered badge with a small square patch on it. Presumably to detect radiation. Don't try to have a casual conversation with these folks. They're not real receptive. The walls of the office are adorned with photos of past atmospheric events. A sign conspicuously posted behind the desk- "Uncleared personnel present-No classified discussion." We boarded one of the two buses for the tour and took a seat. Once all the "tourists" were badged we were on our way on the big white bus with our tour guide. As we drove up and passed through Gate 100 our guide explained the area is, of course, very secure and all employees and any equipment leaving the facility are checked for traces of radioactivity. As we rode the bus we were shown old films of the events as well as newsreels of the day showing how workers placed dummies in the structures to set a "normal family" scenario before a blast was to occur. Our guide indicated that we were about 1 1/2 miles from Ground Zero at Frenchman Flat. Project ABLE, the first atmospheric nuclear test was conducted here in 1951. Kind of gave me an eerie feeling. He explained that, yes, testing was conducting on animals. Pigs were put in pens and subjected to the blasts' effects. He also pointed out the trenches dug for soldiers for military training during the atomic testing. Before a blast the soldiers would crouch in the trench. Once the bomb detonated (and it was considered "safe") they would move across to Ground Zero as if moving against the enemy. The objective was to desensitize them to the perceived effects of the blast. It gave me an unsettling feeling, knowing what took place there. Our first stop was at the Hazardous Materials Spill Center (HAZMAT) .The spill center located in Area 5 of the Test site conducts hazardous materials testing and training under controlled conditions. Activities include emergency response training, fire suppression training along with testing of protective gear and procedures. The area is home to a tank farm containing systems for the release of liquids, gases and cryogenic liquids. The facility also includes a wind tunnel for testing as well as storage pads. We were assured that tests reveal no traces of the chemicals in the air and there are no adverse effects on workers. Due to the weather conditions we were told we could not drive through Frenchman Flat so we went directly to the Area 5 Radioactive Waste Management Site. Here the 30-year-old low-level radioactive waste facility stores material such as lab waste, construction debris and reactor equipment. Approximately 98 of 732 acres are currently in use. The burial pits are approximately 3 football fields long and 22 feet deep. I was fascinated to actually see this facility after reading so much about the controversy surrounding it. Throughout our drive we passed a number of craters created by the underground blasts, but of course, nothing could compare to the mighty Sedan Crater. As we drove to the crater a sign pointing to Gate 700 peaked our curiosity. Gate 700 is the one that connects the NTS with our favorite secret base. We could also see a long row of powerlines leading into Dreamland. We arrived to the viewing platform at Sedan and were allowed to get off the buses to get a closer look. The view here provides an "up close and personal" reminder of the power generated from this blast. 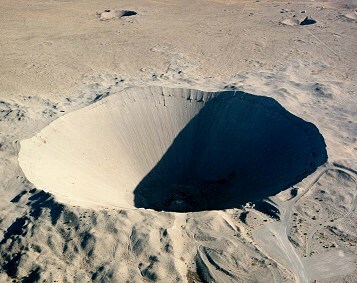 Sedan is the result of a 104 kiloton explosion which threw up more than 12 millions tons of earth. Sedan is a massive 320 feet deep and can be dizzying to the observer. The Sedan test in 1962 was part of what was called the "Plowshare." This program was designed to develop peaceful uses for atomic energy such as construction. We then took an unscheduled drive to Area 12. During the years of testing the area was a bustle of activity with the workers. 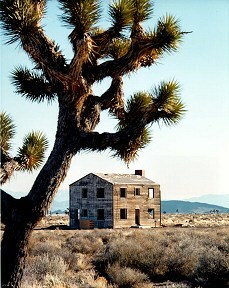 New living quarters were built, but had never been utilized. The place looked deserted and dead. We passed the area that was home to the Apple II tests. Here we saw the remains of a few structures such as a house seen in many of the old nuclear propaganda films of the fifties. Another sign that caught our attention was one pointing to the BEEF facility. Where's the Beef? 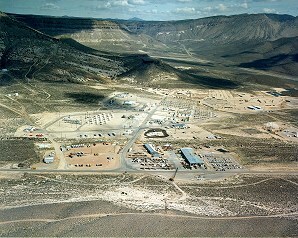 BEEF means Big Explosives Experimental Facility. 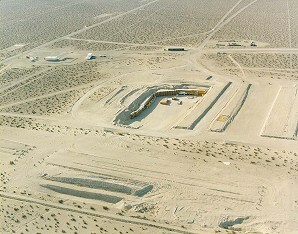 Located in Area 4 of the site BEEF has conducted safely conventional high-explosives experiments using a test bed that provides diagnostics such as high-speed optics and x-ray radiography on the firing table, while operating personnel are present in an earth covered, two-foot thick steel reinforced concrete bunker. Test data was used to develop an effect profile analyzing bunker wall strain, acceleration and noise amplitude. The results demonstrated that the bunker would provide a safe working environment. Our last stop was at the employee cafeteria. Nothing out of ordinary. The vending machine offering "Nukable" treats such as burritos, soups and the like was designed complete with an image of an atomic blast on the front. We had a short break and then proceeded back through Gate 100 and turned in our badges. We plan to go back again, perhaps when the weather is more agreeable. This tour let me see for myself the power unleashed through nuclear energy. Also the devastation that can be caused by such forces. For someone who has never studied or researched nuclear waste management and storage, this tour enlightened me and made the issue of nuclear waste and its consequences real. It's part of our history and it will always be part of our future. For background information Connie suggests the video The Atomic Cafe and the book Atomic Soldiers by Howard Rosenberg. Click on the titles to see a description and to order the items from Amazon.com. 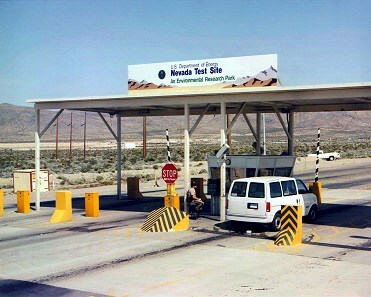 The NTS tour is conducted monthly by the Nevada Department Of Energy. For more information on the tour and to sign up see the DOE Web Site.